Layering is key during the fall season, not to mention I’m on a leather craze. I’m constantly thinking of ways to create more looks with my existing pieces. 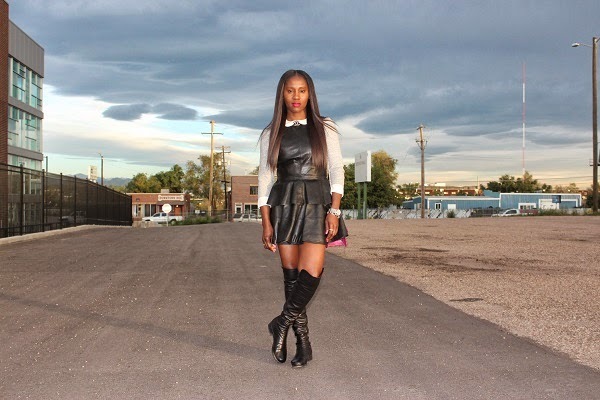 So prepare to see this leather peplum top a lot this fall/winter season. I love leather and I especially love how you paired this with the pop of pink! Shopping for a new pair of over the knee boots, love this & I think you can definitely remix this outfit a lot more in the future! Thank you. This leather top is slowly becoming one of my favourites. Thanks for viewing. Make sure to join the blog lovely.